This is one of those weeknight meals that I’m always a little hesitant about posting. 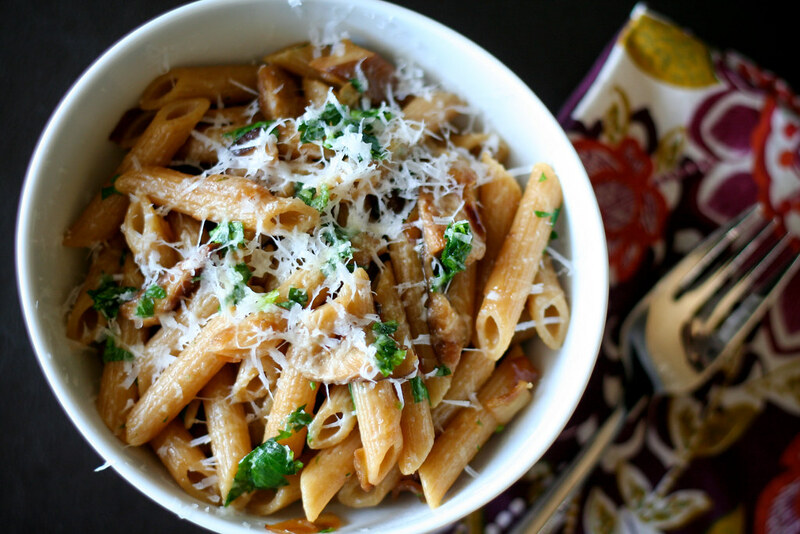 Caramelized onion and mushroom pasta – isn’t that too easy? Are people going to roll their eyes at this? They might. Yes, advice it’s a very simple recipe, medications but everyone needs simple recipes to add to the weeknight repertoire, myocarditis so I’m posting it anyway. This pasta is just easy enough to make after work, but still interesting enough to make a Tuesday a little more exciting. It starts off with some onions caramelized in butter. Once they start to melt into sweet deliciousness, add some shiitake mushrooms and cook until everything browns and melts together. To brighten it up, make a quick pesto-like sauce with Italian Parsley, olive oil and lemon juice. Toss some pasta with the mushrooms and onions, top with some parsley pesto and dust with Parmesan cheese. 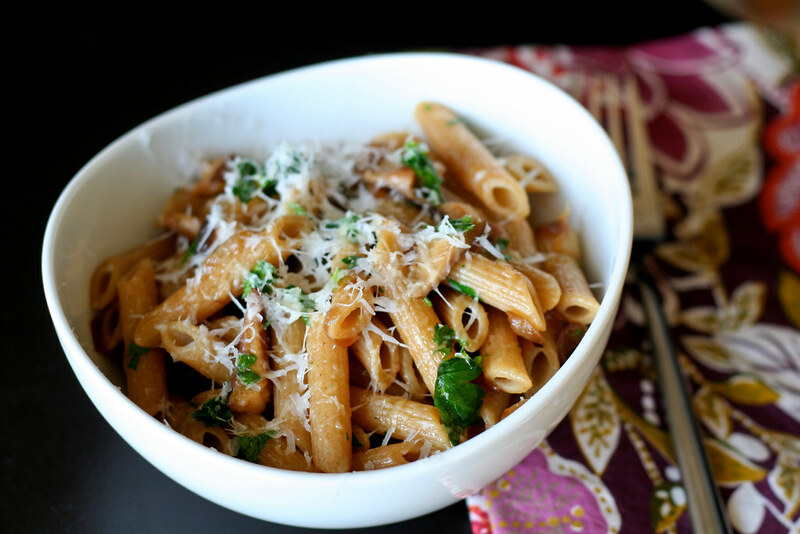 The pasta gets a nice, deep brown flavor from the shiitakes and an herby lift from the parsley. It’s a really simple, really delicious dish any night of the week. Heat a large saute pan over medium-low. Once it’s hot, melt the butter and add the onions. Saute for 20 – 30 minutes or until the onions soften and begin to brown. Add the mushrooms and cook for another 10 – 15 minutes, then add the salt. While the mushrooms and onions are cooking, prepare the parsley pesto. Chop the parsley leaves and finely as possible, then mix together with the olive oil and lemon juice. Set aside. Cook the pasta according to package directions (don’t forget to salt the water!) – until al dente. Reserve 1/2 cup of the pasta cooking water, then drain. Toss the pasta into the large saute pan with the onions and mushrooms and add the pasta water. Mix until well-combined. Serve in bowls, top with a spoonful of the parsley pesto and a generous dusting of Parmesan cheese. Makes 4 entree-sized servings or 6 side servings. Love the simple yet tasty combination of flavors Mel – exciting any day of the week! I found your blog when searching for roasted chickpeas (the post was from, like, a year ago), and I’m so glad I did! I think this is pretty gourmet for a Tuesday! Sounds awesome. You can’t go wrong with penne I even bake it. I should make this for a friend of mine, problem is.. “shiitake” too much and I can’t get a word in. Weekday dinners can never be too simple. This look like the perfect dish to whip up on a busy night. Thanks. This looks super tasty and I have the ingredients right now! I’m going to make it for dinner. Thank you!